Brain Injury: Head trauma when a steel pipe load on his work truck broke loose. 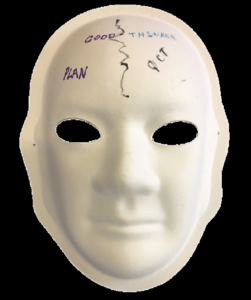 Explanation of Mask: I’m sort of in a limbo with only a small opening in my throat and 2 caved in areas on my head on the right side. 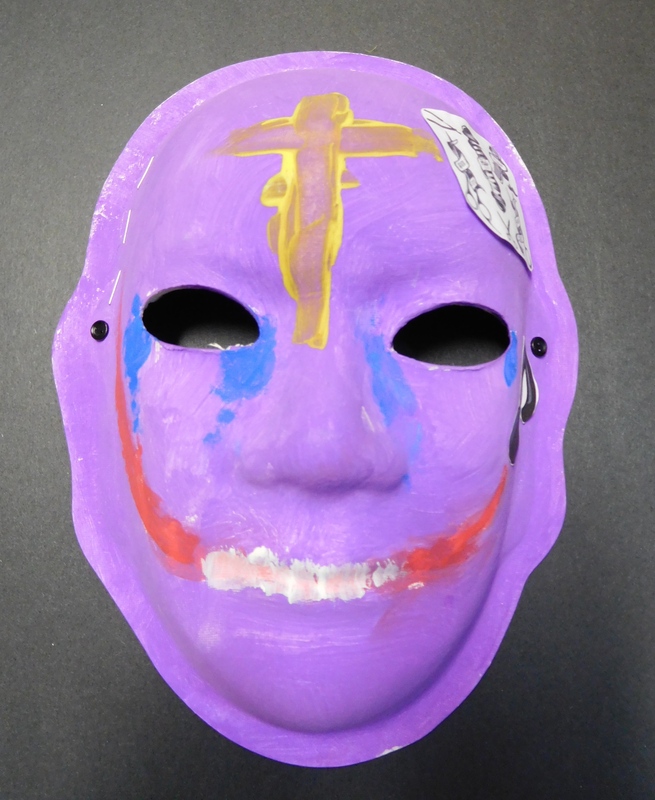 The mouth represents equal “smile” and “frown” times of happiness and sadness. The small nasal openings show my small airways. The arrows on my forehead show my angry times and happy times. 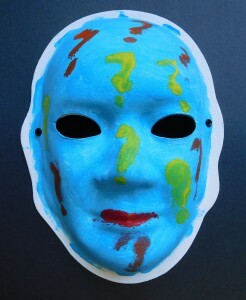 The orange question marks show the things I can’t remember. The purple represents lightening up to the blue cloud and yellow sun, which wait for me in heaven when life is over and the next adventure begins. 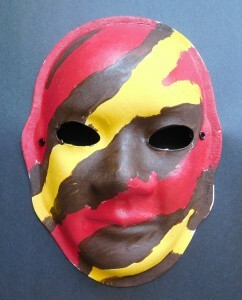 The brown and black stripes around the eyes represent the hidden flaws that people can’t see inside of me. Explanation of Mask: Short term memory. The dark space on my mask is for my memory loss. 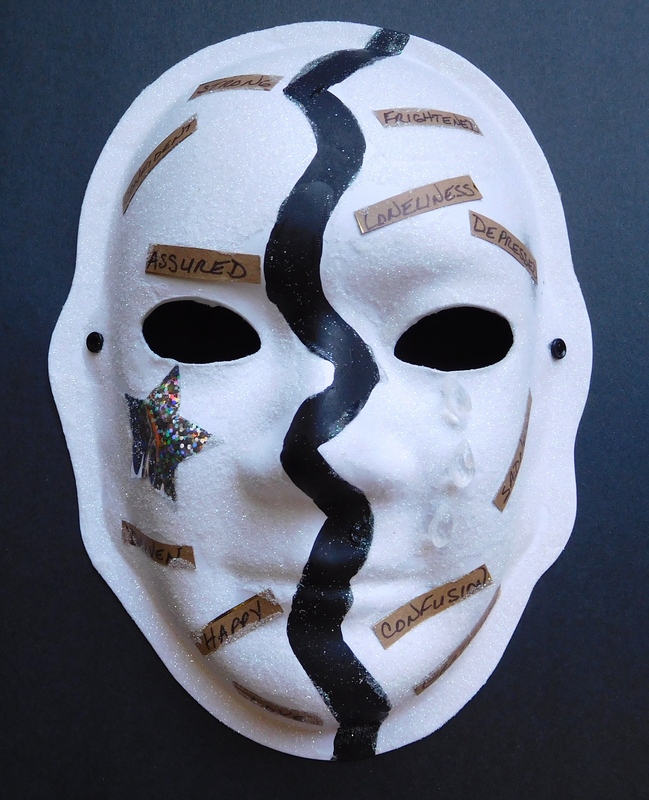 Explanation of Mask: The emotions tell how I feel on the inside and the outside. Sometimes I want to cry and sometimes just forget the world and be lost in my mind and when I get lost in my mind I can get real mad and furious. I got a kind heart but I let my mind hold me back in this world. Explanation of mask: When I think about my brain, I feel happy it’s healed by now. I laugh a lot. 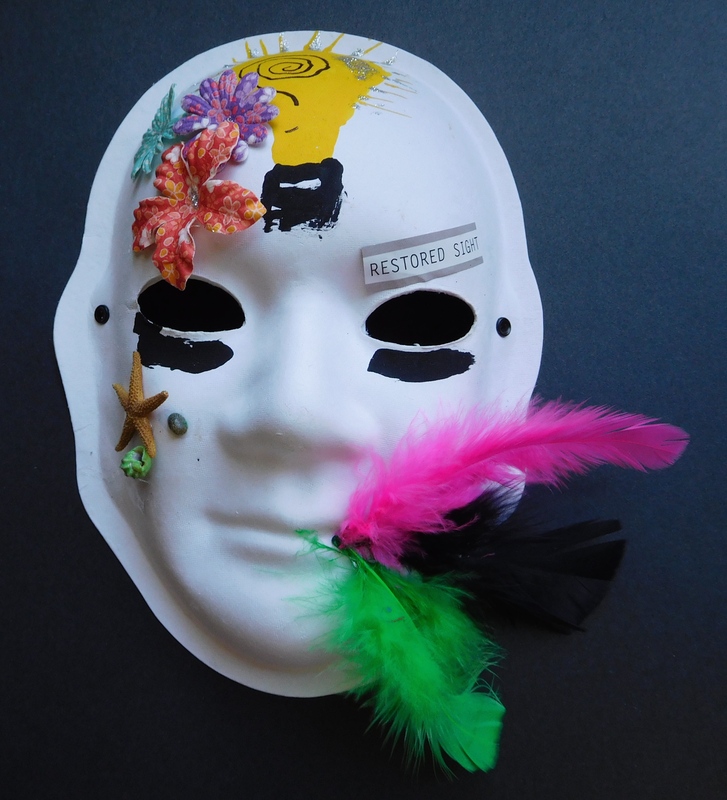 I decided to make the mask green and yellow because I like art, I dream a lot, I think hard. Explanation of Mask: My mask means the most to me. I have never done a mask of this altitude, fun wright. 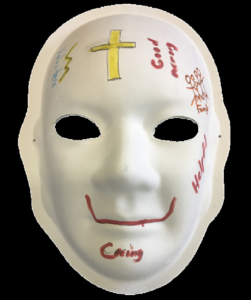 Let me tell you what my mask mean to me, I put the Thunderbolt on the forehead for luck of the Lord; the sign on the forehead is a peace sign for us all on earth. The dollar sign means it represents I’m fabulous, the star represents I’m dynamic. The butterfly represents life is easy. I’m a happy person and that’s it. 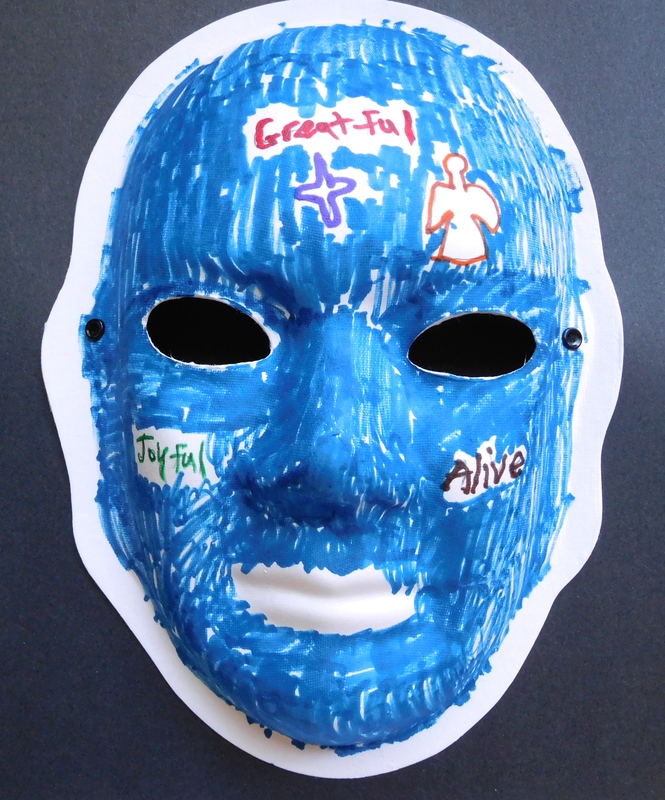 Explanation of Mask: I painted the mask blue because I felt free. 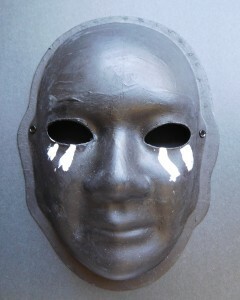 I put teardrops on the mask because I lost a lot of my sight. The rainbows in the eyes are a symbol of my creativity. The heart shows that I am loving, and the butterflies show that I am pleasant. The flowers show that I am content. The spiral and the question mark are to show that I am sometimes confused. The red chin has to do with being irritated. The frown is for when I feel heartbroken. The smile shows that I feel joyful and proud. Explanation of Mask: I put flowers on the mask to make it look pretty. Brain Injury: Had a virus called HSV and it spread to my brain. I now have trouble with my memory. 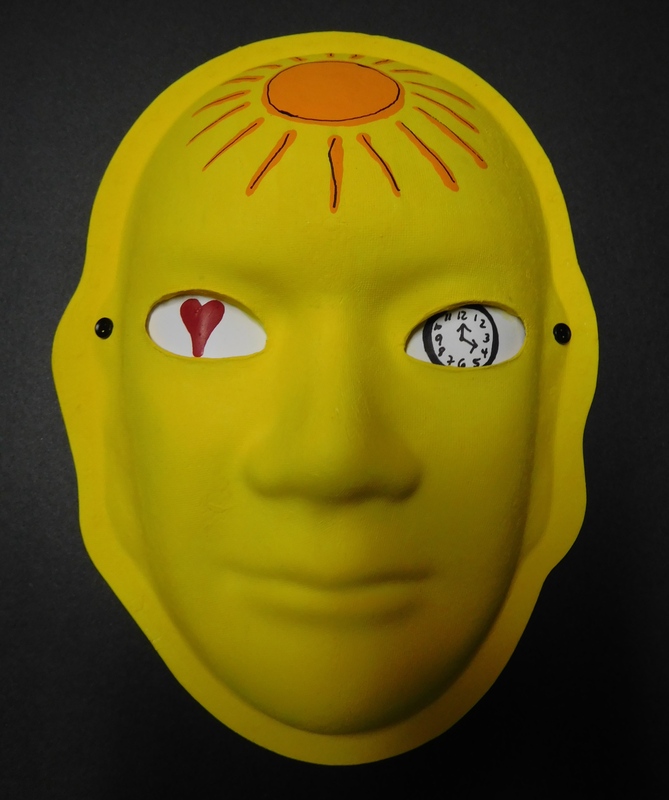 Explanation of mask: The year 1968 represents my wisdom, it is the year I was born, the check mark represents when I feel stable, clear, and easy. The crack in my mask at the top represents when I feel frustrated, challenged, distracted, confused and worried. The book represents my love for reading. I feel calm, peaceful, and relaxed when I am reading. I wear glasses and they keep me focused. I put a bright yellow in my eyes to show energy. 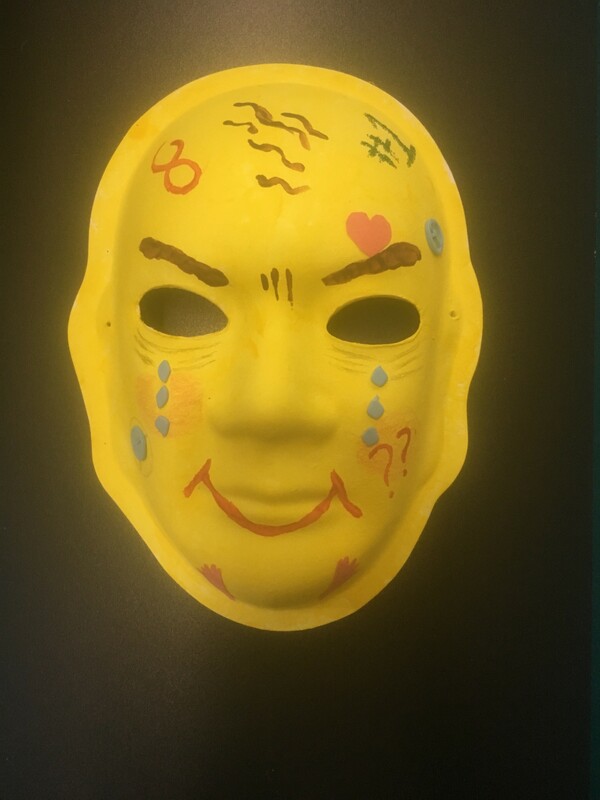 My mask is smiling because it shows that I feel good, appreciative, awesome, cheerful, humorous, comfortable, delightful, fabulous, joyful, positive, and kind. The heart on my chin represents when I feel love. The baseball on my cheek represents when I feel playful. 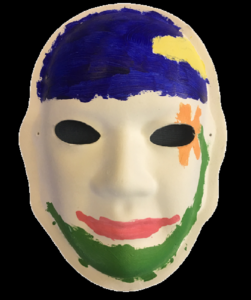 I chose to paint my mask green for clarity and content, the blue represents when things get confusing, and the yellow represents when I am happy. 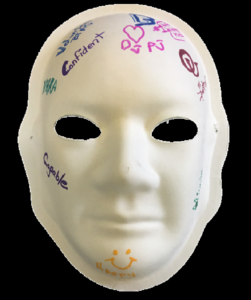 Explanation of Mask: I feel lively, confident, smart, determined, worthwhile, and safe. The peace sign represents that I am in no danger. The hands on the bottom represent that I am in safe hands and accepted. The number one means I am worthwhile. The infinity sign means unlimited. The question marks mean that I am not always sure what’s happening. Blue: I was sad. I was blue. I have a smile because I survived. I was happy. Gold Glitter: Where my injury was. 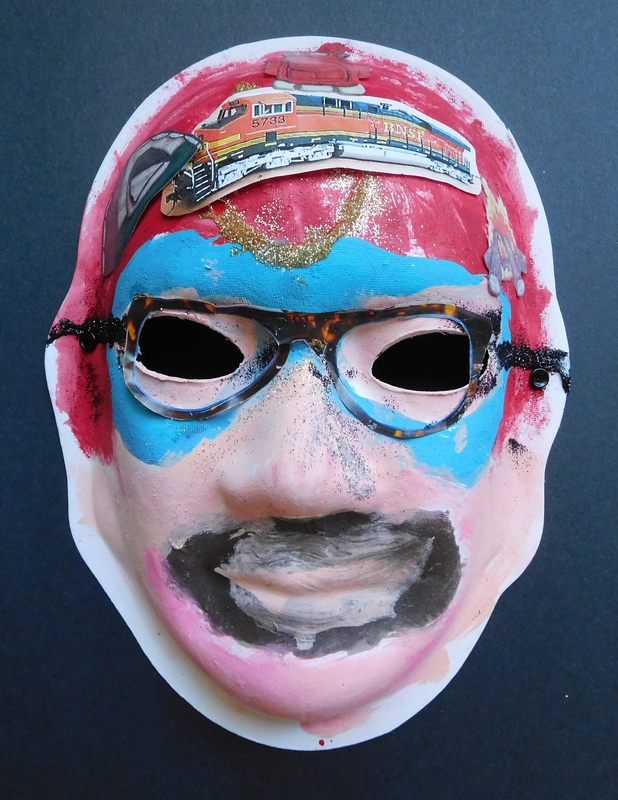 Train: Since I was four I have had trains, so I was thinking of trains and it made me happy. Outdoor Stickers: Because I am a Scout Leader. I thought of that and it made me happy. Black Lips – I can’t say anything to them. I can’t talk. Black Spot – When I first had my stroke, they gave me a (tPA) shot. The next two times I couldn’t have a shot. They thought it might make my brain bleed. Teal – Me crying. I get sad. Two Pink Breast Cancer Ribbons – Those are my girls! Pink Color – For breast cancer. Yellow – That’s my eyes seeing things. I can see in my mind what I want to say but I can’t say anything. I want to speak. I wish people were able to understand me. I wish I had my speech. 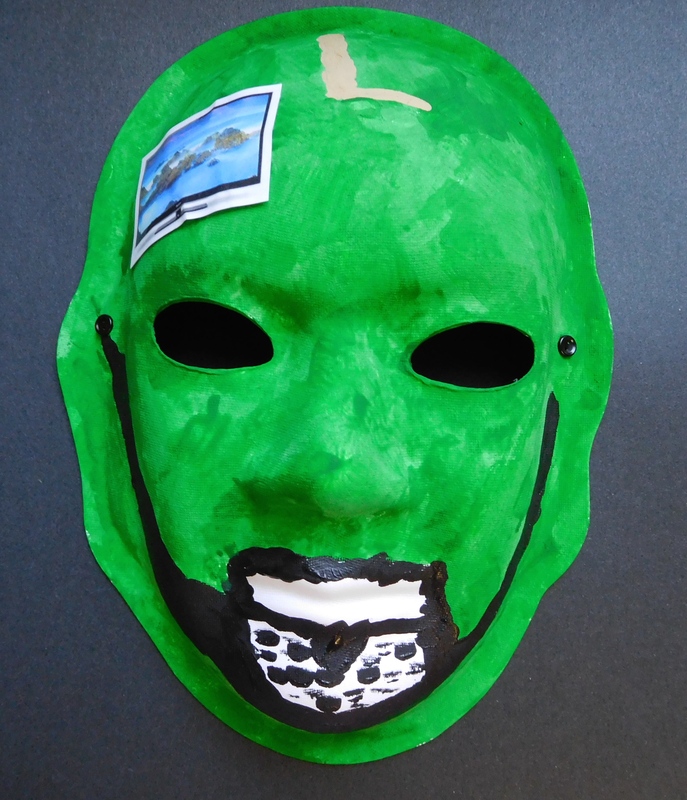 Explanation of Mask: I chose the color green because it is my favorite color. I had a beard after my surgery while I was in rehabilitation. It was hard to shave. I never had a beard before, and I never knew that I could grow one! My beard was black. The scar is from my surgery. I chose the color tan because it is the color of skin. I used to watch TV all day, everyday when I was in the recovery room. They showed relaxing nature channels like the one on the TV screen. 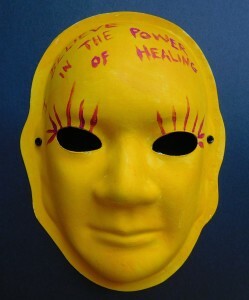 Explanation of Mask: The yellow signifies my optimism about the continuation of healing in the brain, spirit and body. Always move forward. Get up and go for it. Open the shades and let in the sun. Find the improvements and celebrate them. Be thankful for what is going well. Explanation of Mask: The blue because it’s my favorite color and I was feeling blue. The red lips, headband and stars are because I like pretty things. Even though I had a stroke, I still enjoy looking good, putting on make-up and getting my hair done. 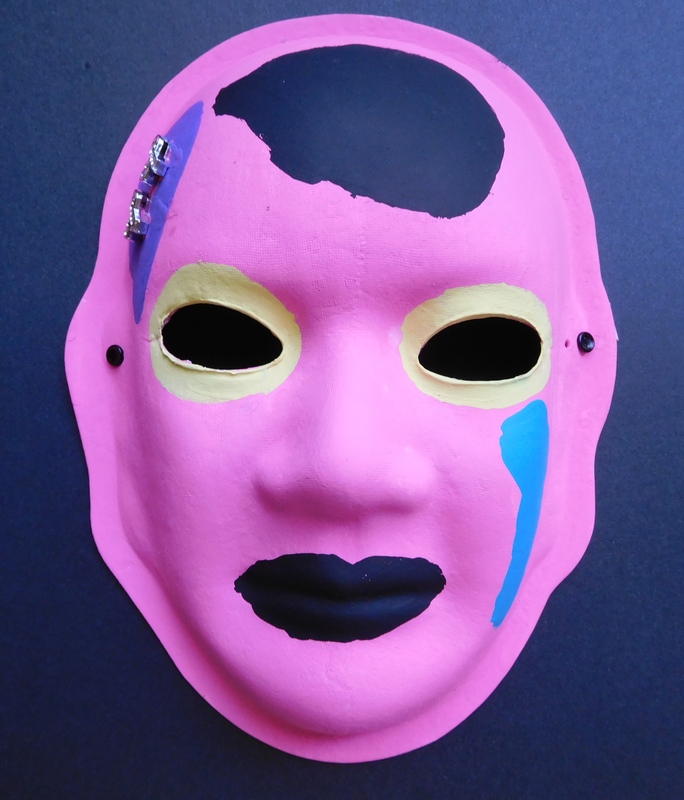 I bought my daughter a pretty mask like this before she passed away and it reminds me of her and makes me happy. We refuse to give up! So, we got Bryan flown to a new hospital. These doctors, well they did not give up!! We now had the hope we were needing!! The doctor worked his magic, went through Bryan’s forehead and extracted the bleed. We like to call that spot his “Badge of Courage.” Luckily, Bryan is left-handed so his doctor has lots of hope. Bryan can speak and with his Strength, Determination, Therapy, Support and Love from Family and Friends, and of course Faith… every little thing is gonna be alright is all part of the left side of the mask… Three weeks at the new hospital, five weeks of inpatient therapy and his journey continues!! 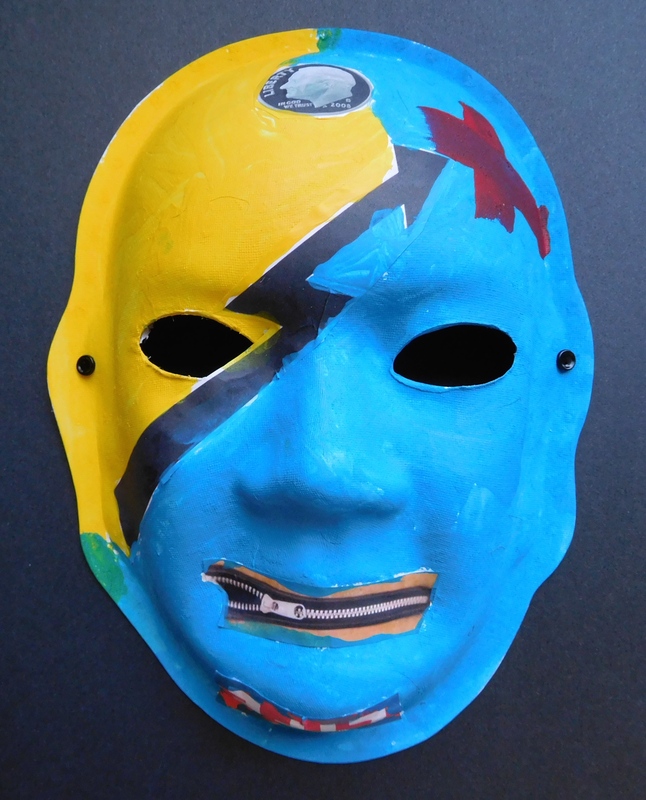 Explanation of Mask: The blue side of my mask is me before the stroke. The gray side is me after the stroke. 1) Sad Face: lost friends and family. 2) Purple Monster: angry about all that I had lost. 3) Puzzle Piece: parts of my life were now missing. 4) Ear Question Mark (? ): couldn’t understand what was said. 5) Laughing Face: felt people were laughing at me. 6) Apple and Pencil: so much I knew before was now lost. 1) My life turned on a DIME (dated 2008) when I had my stroke turning my life UPSIDE DOWN. 2) I went from sunny YELLOW to depressing BLUE mainly due to my aphasia and apraxia (ZIPPERED MOUTH). 3) The stroke hit me light a LIGHTENING BOLT, and the RED X marks the spot on my left side of my brain. 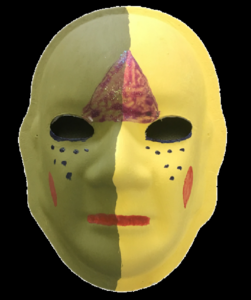 Explanation of Mask: I picked yellow because it made me think of normal. My left side was good. The black line separates where everything went bad. The gray side is broken, and there are veins that run everywhere. I recovered at Rockford Memorial Hospital for two weeks. I did my rehab at Northwestern Hospital in Chicago for three months. I had no movement on my right side and was not able to talk. I was determined to get back to normal. 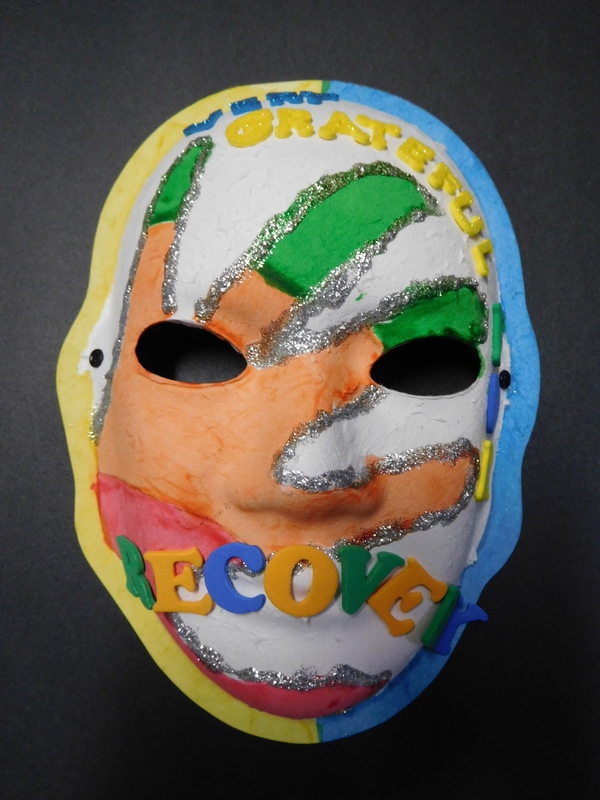 I went to Provena in Rockford for three months as an inpatient working on everyday tasks. Then, I went to Van Matre Rehab Hospital as an outpatient for occupational, physical, and speech therapies for six months. Today, I have 50% movement in my right leg, no movement in my right arm and hand, and have full vision. 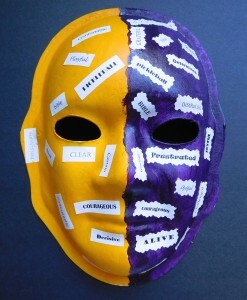 I struggle with Aphasia to communicate with people. There are challenges everyday – physically, emotionally, financially, spiritually, and relationships. But, I’m alive! Explanation of Mask: Prior to my injury, I was a DJ. I love music. My last name is Underwood. I suffer from memory loss and I have lost vision in my left eye. Through everything, I am looking ahead. I have a big heart and still have a lot of love to give. 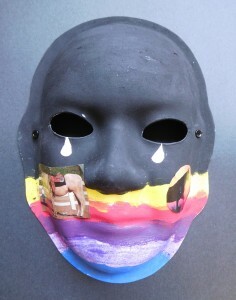 Explanation of Mask: Teardrops: sadness for being blind. Rainbow: happy for being alive. I ride horses. I have been in the Special Olympics and have won many gold and silver medals. My life now is riding horses. Purple: My favorite color. It makes me happy. 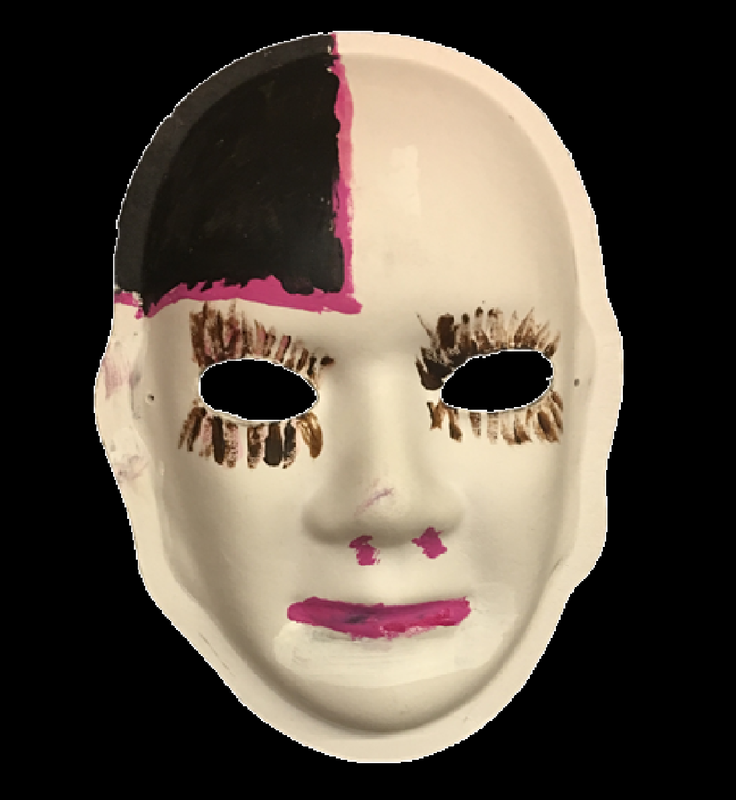 Black Glitter: My surgeries left a hole in my head. I can still feel where it healed. Pink Sequins: The color pink represents how I feel today and most every day: I feel happy. It also represents the blood in my head. Cross: Jesus is always watching over me. Butterflies: My guardian angels. Also, I have some trouble with my speech since my stroke and saying words like “caterpillar” can be difficult. Hummingbirds: They lift me up. Dog Hair: The dog hair on the chin of the mask is from my dog, Puddles. He is my baby! Feather: They had to shave my head when I had my surgeries. The feather represents my hair growing back and making me feel pretty again. 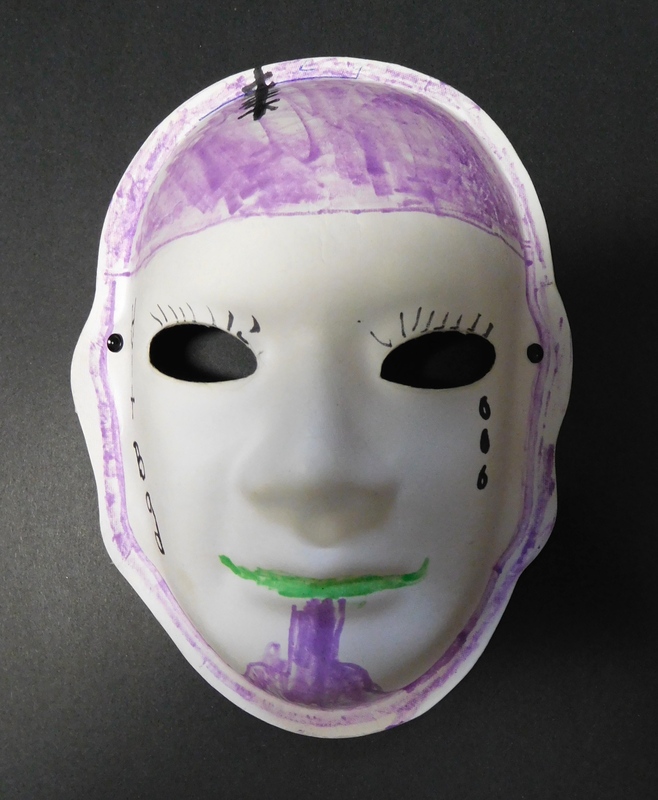 Explanation of Mask: I couldn’t drive. My legs and arms – I couldn’t move them fast like I was used to doing. I was used to going. Every turn I took the doctors told me “no” about driving, I think like they do with everyone else with a stroke. Then the doctors finally told me “YES,” I could drive and I regained my FREEDOM! Now I’m driving all over the place and even driving myself to dialysis. I lost my wife six years ago so I don’t like to have to rely on people. I painted tears of hope instead of tears of frustration that go along with everything like not getting to do what I want to do. I learned how to drive again on a riding lawn mower and want others to know that might be a good way for them to learn how to drive again, too. I thank God, my family, and friends. I am a fisherman and tie my own flies and jigs. I’ve given 19+ gallons of blood. I’ve worked at Rockford Park District for 27 years. I am married and a “dad” to three dogs who are puppy mill rescues. I serve at my church by greeting people. I am on two board of directors that serve people with disabilities. I love to go to the gym. I am a Rockford Noon Lion. I’m a very happy, positive person and teach positive attitude to different groups. 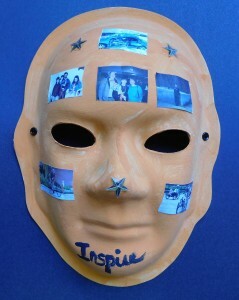 Explanation of Mask: Made to Inspire. Wrecked car encompasses some beginning family members followed by the new family and a new degree stemming from the National Guard. A new bike as a new beginning followed by a bike that I professionally ride today. Gold Stars shine bright as each day passes. Orange brings brightness to each new day. 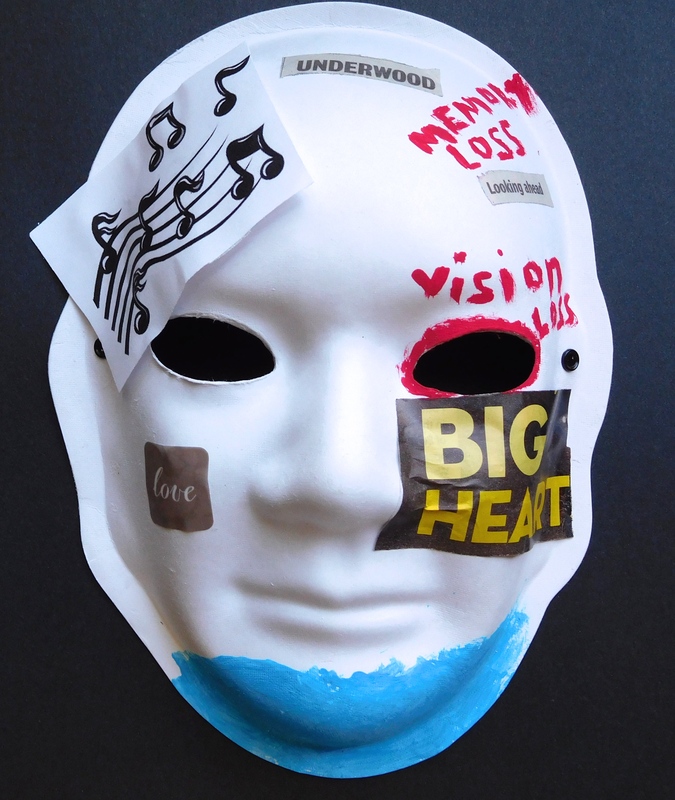 Explanation of Mask: Red: The spirit of the body. 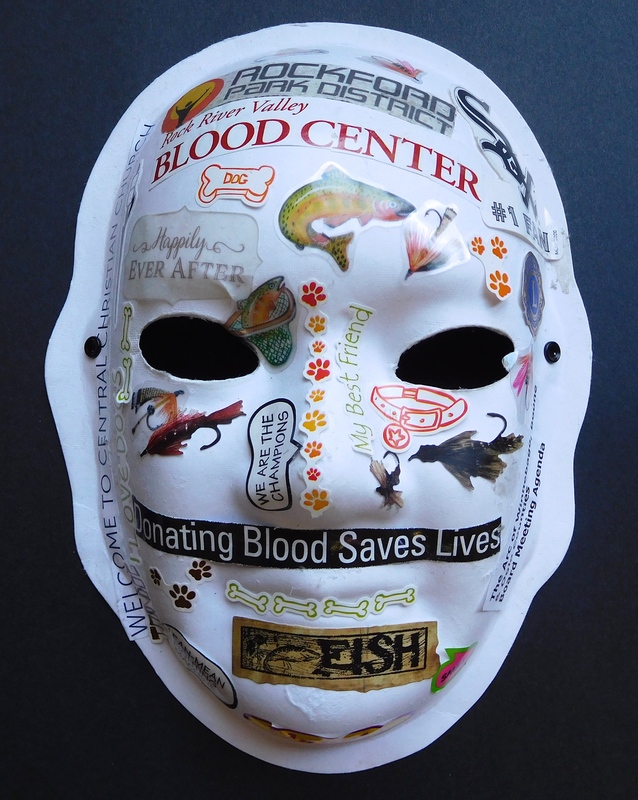 Blood makes you who you are. Smiles. 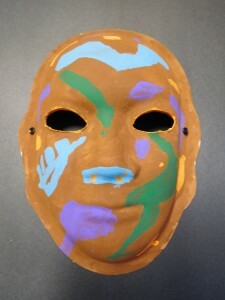 Brown: A base color. Yellow: A wild strip down the middle! 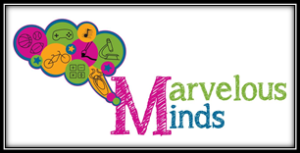 Makes everything different – it’s cool! Makes you think about what you’re doing and all the great things that are out there. 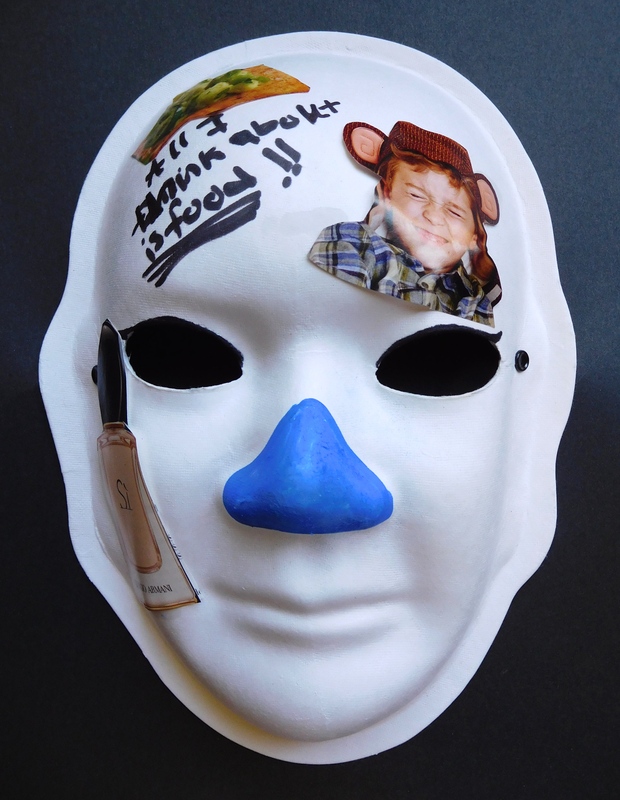 Explanation of Mask: With the brain injury, I have mostly short-term memory loss. Things that happen now get lost in my brain and, since this happened in 2006, I’ve lost a lot. On the positive side, I’m still here! Most people think I’m ok, but that’s me keeping things to myself. Van Matre is where I woke up from my coma! Brown: My skin color. I tried to make it look like me. Question Marks: Show where my brain injury was in the front –in my frontal lobe. Yellow: The lightening. I was hit by a car, but my head hit the windshield. The whiplash sparked everything inside. Tears: It does make me sad. Before my accident I could count on one hand the number of times that I had cried. Since my injury, I’ve bawled like a baby. That’s why I like this (Headlines) support group. It’s a safe place. I keep it in a lot of the time and don’t share. 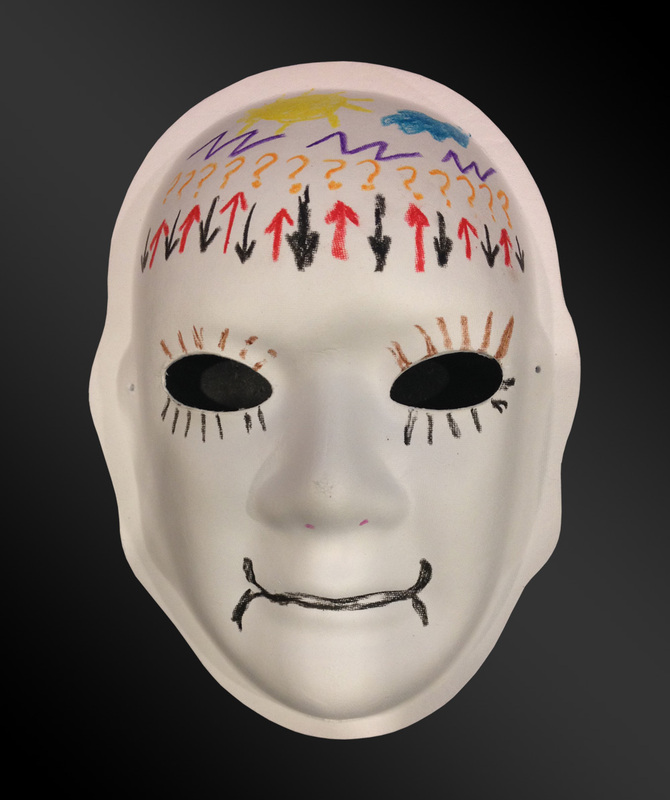 Explanation of Mask: My first memory is waking up lying in the hospital bed not knowing what happened. I felt scared, confused, tired, and felt some pain in my stomach area. The people who I saw first were my parents. Seeing my parents made me feel relieved. Participating in therapy while in the inpatient hospital was exhausting. When I left the hospital to go to my parents, I felt relieved. I felt more alive and grateful. Not being able to do the things I used to do and relying on them made me sad. 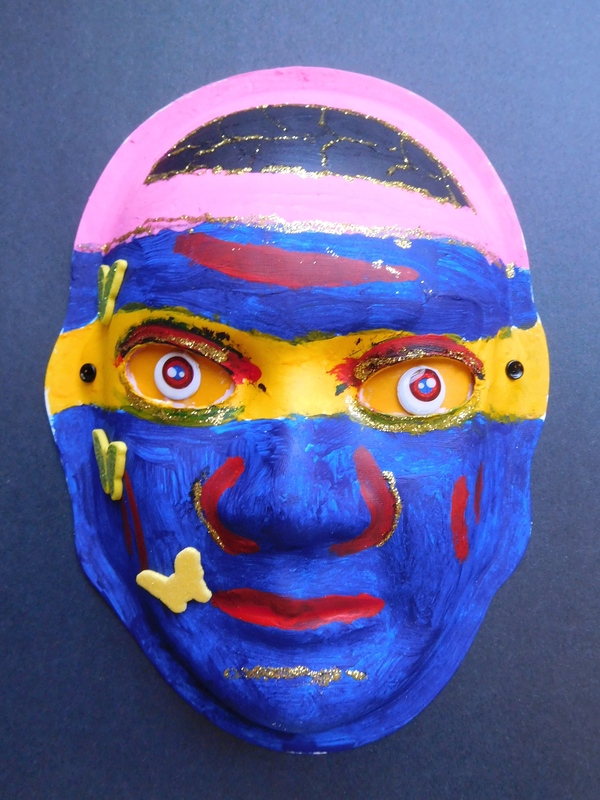 As a result of my brain injury, I had difficulty using my hands, walking and talking. I was still able to read the newspaper and watch television. Grateful represents being healthy again. Joyful represents being happy to be independent again. Alive represents feeling alive again. I realized how important it is to be alive. The Cross represents my faith in knowing that I was going to pull through. The Angel represents my family watching over me. Blue represents my favorite color and my strength. 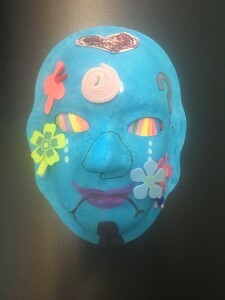 Explanation of Mask: I passed away and they brought me back. I had to start from the beginning and excel to me now. Blue Nose: Represents that I lost my sense of smell. Under the circumstances I was in, losing my sense of smell is better than not being able to walk. I’m not so much sad about it because I have more important things in my life.I used the blue color because it signifies being a little sad about it not working. Fragrance: It was my favorite fragrance. Monkey: Represents my love for monkeys! I’m always posting things about monkeys. Eyeliner: Because I’m really good at drawing eyeliner. Food: Because I’m always thinking about food and hungry since my accident. 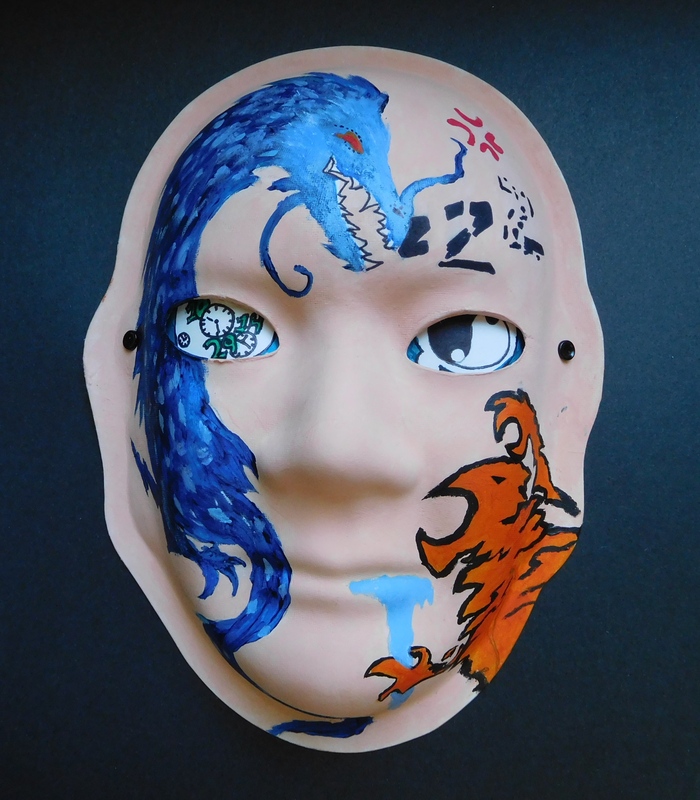 Explanation of Mask: Blue and Green are my favorite colors. My left side was more physically affected since the right side of my brain controls it. I made it blue because it represents my feeling of having to start over. 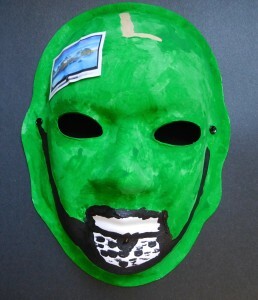 Green is my creativity that is still intact. Green also means moving forward. The glasses represent visual difficulties and the nosepiece represents bridging the gap between the brain hemispheres. The Horse represents freedom. I included Flowers because I like them. The Piece of Blank Paper is a blank page for starting over. But you grew courageous instead. But you kept on going. But you called them adventures. But instead you called them wildflowers. But you fought on to be a butterfly. But instead you chose to show yourself some self love. But instead through them you realized your light. 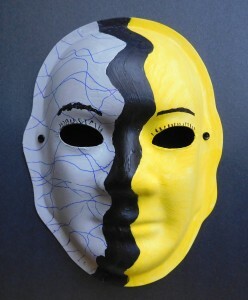 Explanation of Mask: The left side represents my life before my stroke. It is yellow, which is a bright, cheery, positive color because life before my stroke was easy. 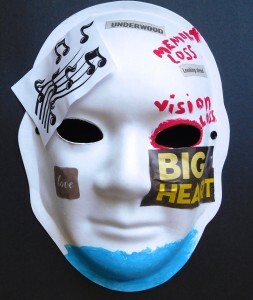 Before my stroke: I was vibrant, clear thinking, purposeful, athletic, and very active. Time was at the forefront of everything I did. I was also decisive, passionate, comfortable, playful, enthusiastic, stable, certain, clear, and relaxed. I felt very courageous prior to my stroke, which is why it is written in large letters. I was also very active in pickleball. God was a part of my life before my stroke, but not nearly to extent that He is now. This is why “bible” is written in small letters. The right side represents my life after my stroke. I chose purple which is a dark, murky color with less sunshine because life after my stroke is difficult. But, just because it is harder doesn’t mean I don’t do it! Since my stroke, I feel slowed down, deliberate, not a salve to the clock, lead a more simple life, and have better management of time. My emotions are at the surface compared to before – I’m more sentimental – the little things mean more than they did before. I feel both positive and negative feelings. 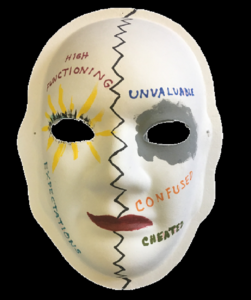 The negative feelings include distracted, different, challenged, frustrated, and tired. The positive feelings include free, gracious, determined, uplifted, joyful everyday, happy in the moment, and ALIVE! Pickleball was an important part of my life before my stroke. I still play now and enjoy it, but I am not quite as good as I was. This is why pickleball is written in small letters. Similarly, I felt very courageous before my stroke. Now, I continue to try to not let my difficulties hold me back, but it is a challenge. This is why courageous is in small writing. Most importantly, I have a huge new sense of gratefulness. My life is expanded by all of the new friends I have made through the support groups. I have also grown spiritually since my stroke, which is why bible is now in much larger letters. Tim, Jeff and Jen are my children. Chris, Madison, Ashley, and Riley are my grandchildren. Kim and Michelle are my daughters-in-law. Extended family has come to mean more to me than before. I got a second chance at life and realize now that it is precious! 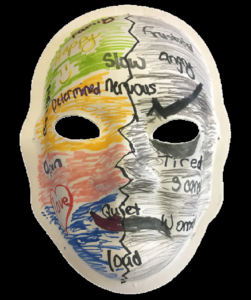 Explanation of Mask: My first six months were a blur, in and out of facilities, crying, not knowing why, and unexplainable mood swings. I didn’t understand what was happening. My brain function was slowly improved. Physical body improved with much PT, OT, and speech therapies. 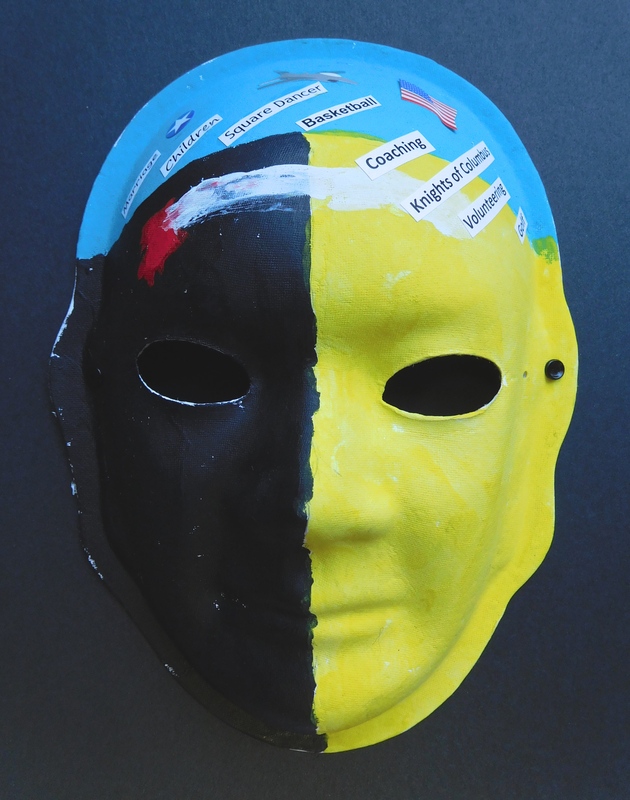 The blue represents my moods at the time and the yellow represents the feelings I wanted to stop. The pink shows that I feel I’ve lost a lot of rationalization and cognitive thoughts. The black area is my brain. I hope this never happens again! Blue: I like the color blue. Orange and Yellow: For contrast. Question Marks: For confusion. I didn’t know how to help him when it happened. Even when the paramedics came, I felt lost. I wanted to help him but I couldn’t. I couldn’t even get close enough to him to hold his hand. 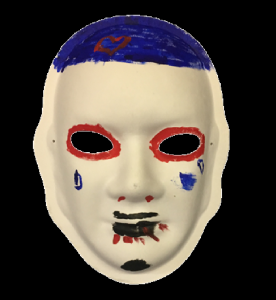 Explanation of Mask: The black, red and blue represent the pain and hard work in therapy. The light colors represent the hope. The pink dots are my war paint to get me through this. 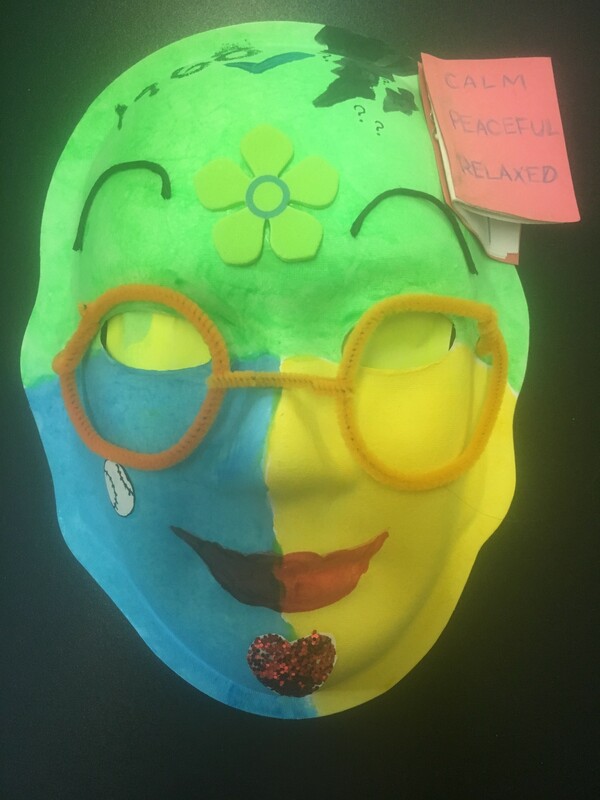 Explanation of Mask: We were studying the Japanese culture in school. 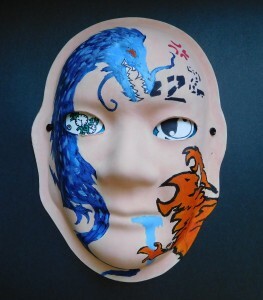 I learned that the dragon symbolizes courage, wisdom, and the mind. The tiger represents passion, power, strength, desire, and the body. When you see both the tiger and dragon fighting, it represents the constant struggle or “battle” between the mind (dragon) and body (tiger). The fragmented “Z’s” represent my sleep. Since my accident, I have trouble falling asleep. The drool symbolizes that I am always hungry. The eye under the dragon has clocks in it to represent how I have no sense of time and the numbers are actually the date of my accident. The other eye has a yin yang symbol in it. 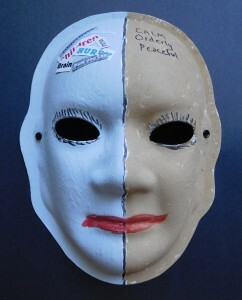 For me, it represents how things after the accident are either black or white – there is no gray. I need to be told specific instructions using a clear “yes or no.” The red symbol is used in Anime or comic books. It’s purpose is to show that a character is angry or upset. For me, it represents my temper since the accident. It’s been much harder to control. I lash out verbally and even the slightest difference in what I’m expecting would send me into a tantrum. Yellow stands out to me and I notice the color Red better. Yellow represents being exhausted. Red – the red apple – represents delicious. Apple pie is my favorite. Rainbow represents creative. I like the colors of the rainbow when I see one out in the world. The Walker is for getting around. It makes me feel ashamed. Last September I fell and broke a hip so now I need one and have needed it since my stroke. Pink represents cheerful. White represents alive. Purple represents content. Hopeful and Grateful – I’m still here and look forward to getting better. I have a shining faith in God and believe in the power of prayer. I had a miraculous recovery considering the extent of my injury. Through good care of the medical team and support from my four children and the good care and therapy at Van Matre, I’m doing great and I know how fortunate I am. Explanation of Mask: Blue is before my stroke. Black is for the stroke. Yellow is when I came out of the stroke (where I’m at now). 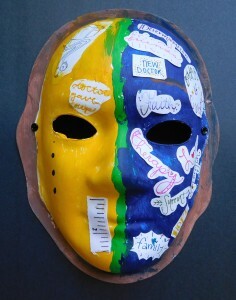 Explanation of Mask: The two sides of me: The calm, peaceful and orderly side of me. And the injured, disorderly side with scrambled thought process. The disorderly side droops. 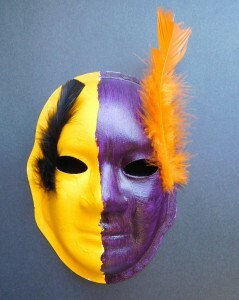 Explanation of Mask: Yellow represents happiness and the purple represents the side of my brain that the stroke occured. 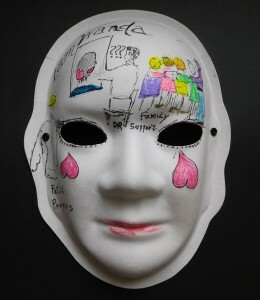 Explanation of Mask: The light bulb symbolizes new ideas. 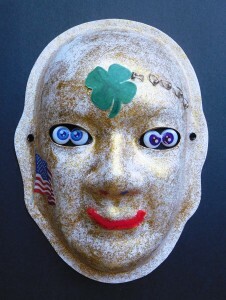 It also represents the thoughtfulness of family and friends. The flowers are colorful and remind me of being in nature. The starfish and shells symbolize frolicking in the sea. 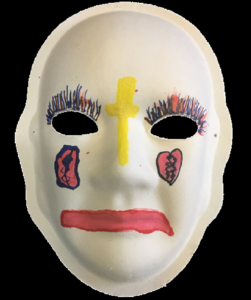 The black lines under the eyes are like athletes challenging opponents because it takes hard work and diligence to get back to how you were. The feathers are a reminder to keep your sense of humor. While you’re doing the dishes, you are doing a lot of thinking about your family, life, and plans. My loving family was still waiting for me, pulling for me, wanting me to live and return home. They are so glad to see my progress – they are thrilled! I have my team on my page and they are rooting for me. I have more time to spend with loved ones. I have more time – extended time. Because my memory is coming back. The sun is shining all over everywhere. I think my brain is bright because I have a bright future. I’ve been given a few extra days or years. I’m here for a reason and I need to find out what that is. There is never any giving up. Never give up. I can’t change what happened, but I can change what I think. There is always a way through it, under it, or over it. 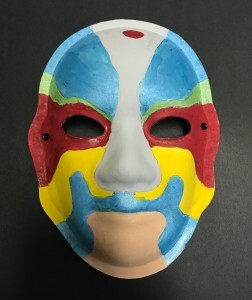 Explanation of Mask: The reason I called it “Left Hand” is because my left side and left hand was affected by the stroke. More than anything, my left hand was injured. After the stroke, I didn’t quite think I was going to recover as soon as I did. I’m very grateful for the hospital I was at and the PT (physical therapy) gave me great confidence. I wouldn’t say I’m 100% recovered, but I’m over 80% recovered. I’m grateful for the help I got from everybody to recover. 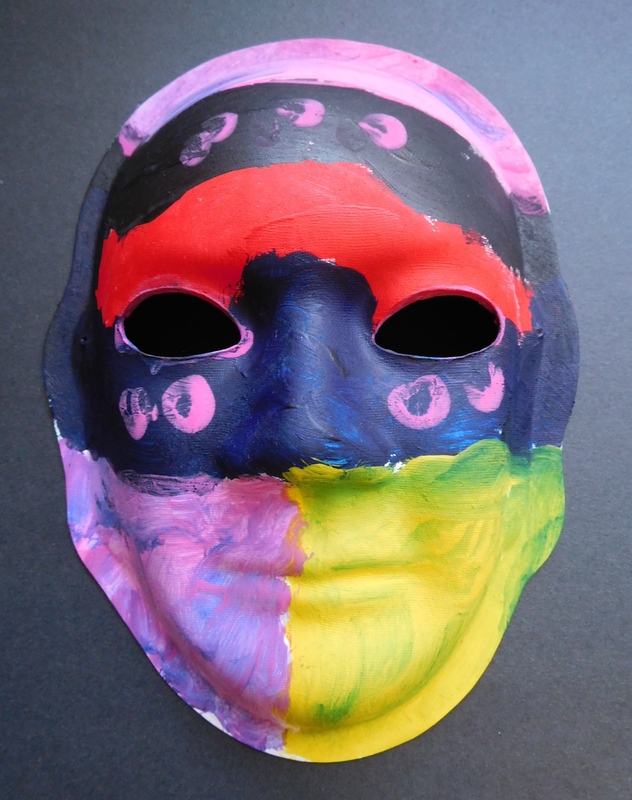 I picked these colors because I like the rainbow and thought it would be something different. I chose the glitter because I like the platinum color. I want to give a special thanks to Van Matre HealthSouth and Swedish American Hospital in Rockford, Illinois. The staples represent the change in my life since my surgery. I got a second chance. It happened to me to make me a better person. I’m not going to take life for granted – things like going to the bathroom by yourself. To get back to my business and use my left hand again. Normal feelings of anger and frustration but love for those around me. For Prince on the radio and Jimi Hendrix. This describes my love of music. For sense of humor – can’t take life too seriously. For new found relationship with Jesus. I tie music titles to all situations. For example, “Hold on Loosely” – like my left hand. but I thought blue was less morbid. I love speech therapy, but it gives me a headache. The tree is right where my head hurts. Because that’s how my eyes feel even if it’s not how they look. Lately, all the time, they feel dry. It reminds me of hope and God’s promise that he will never destroy the earth again with a flood. Lost things I don’t remember losing. Searching for words I knew yesterday. Waiting for things to come back and hoping they don’t get lost. Lost, confused, and frustrating trying to find my way back. The left cheek has an all-seeing eye because the things I see aren’t always the real things. Explanation of Mask: On November 15th, 2017, I had a hemorrhagic stroke deep in my brain that has affected my left side. It was caused by high blood pressure. 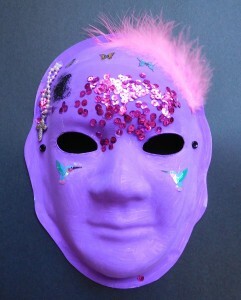 At the top of my mask, I have a clump of purple sequins that represents the stroke location. 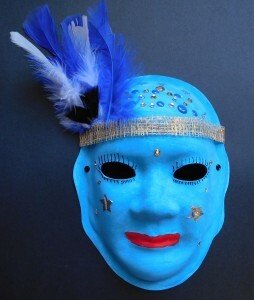 I painted my mask blue because it is my favorite color and is soothing. 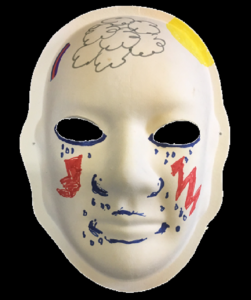 It also represents the melancholy feeling that comes over me when thinking about my stroke and how sad it made my family. 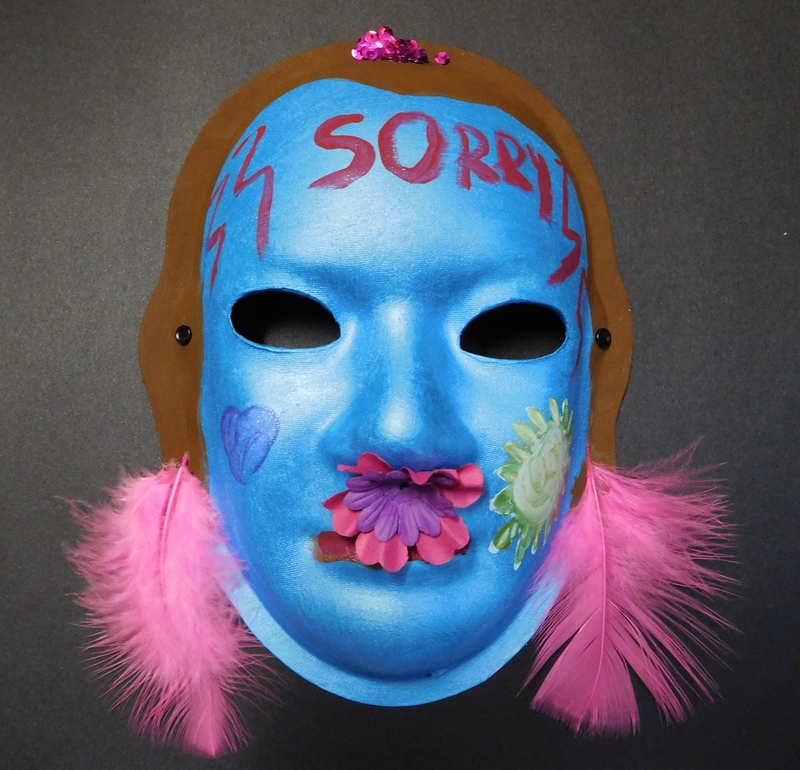 The “SORRY” on the forehead of my mask is because I say that 20 times a day to my family while they are taking care of me. I feel so bad they have to do everything for me day after day. My husband works third shift and I hate having to wake him up because I have to go to the bathroom. 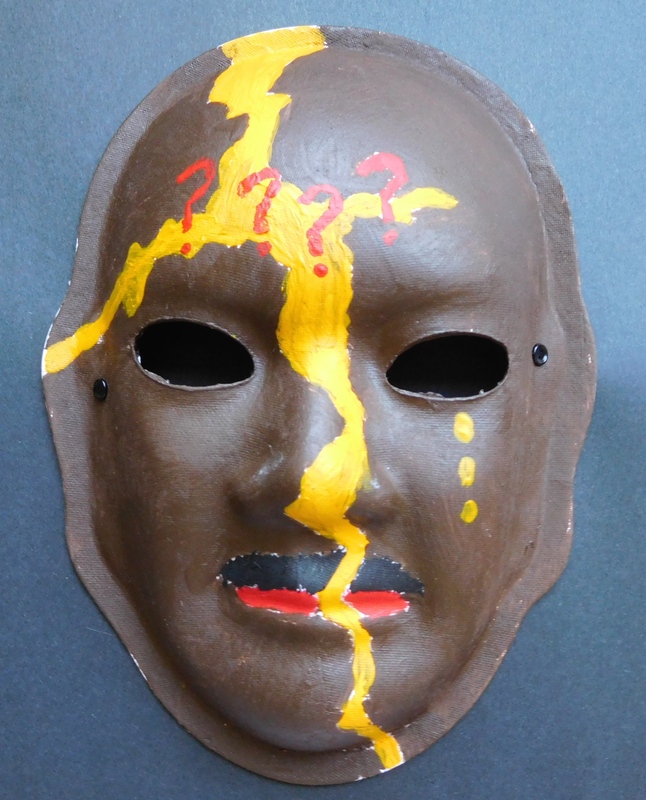 The lightning bolts on my mask is because of the pain I am in – headaches and my shoulders. No matter what I do I am always hurting but try not to focus on it because I know it could be so much worse. The sun on my right cheek is for my normally sunny personality. The heart is to show how much I am loved by my family. I am very, very lucky. My pink feather earrings are to show how flighty I am in my thoughts now. The flowers below my nose are to remind me to take the time to smell the flowers because you never know how long you will have the chance or ability to do so. Explanation of Mask: Yellow is bright and it reminds me of the sun. The sun warms your skin and brightens your day. Silver is for the moon. It brings the night to sleep. Red is for the pain that is leaving my body. The tree and flowers are because I love nature and being outside in nature. Don’t give up, Because if you give up You don’t get to see the sun, moon, trees and flowers. You have to take time because not everything happens all at once. 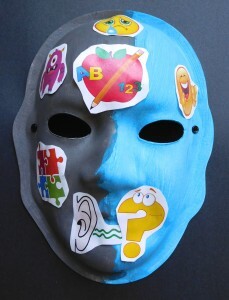 Explanation of Mask: Therapies and speech therapies helped me learn how to do everything again. This is the place to be! That is how I know there was a God – I ended up here. I had a nurse here remove my feeding tube on this (left) side. I didn’t know my ribs were broken, my brain was backwards or something was wrong with it, I didn’t know I had a chest tube. I had a skull fracture and I broke three vertebrae in my back, which still gives me pain. I had problems with my shoulder before the accident but it is worse now. I can’t hear out of one ear and my vision is a little off now, but it has improved. I had a trach breathing tube that was able to come out and then I was able to come here. I really don’t know what happened for about five weeks while I was in a coma and before I could remember things. I do remember waking up and seeing a calendar. The collapsed lung is better now but the broken ribs are still healing. I almost died from the accident and then I almost had to have brain surgery from a meningitis infection that started. I get to come here three times a week for outpatient therapy and I can’t wait to do that. I hated how things were before, but they are okay now. Explanation of Mask: Oct 2014: BLM attacks me during a seizure. For over 200 days post attack I sat drooling with Priapus while my girlfriend was earning our keep. 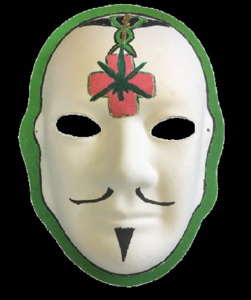 During this time copious amounts of medical marijuana were utilized to aid in the healing of the TBI and PTSD sufferend in the attack. Assailants were lightly prosecuted and given a total of a $235 fine. I suffered loss of A. ability to earn an income B. PTSD C. Loss of a relationship D. victim blaming from friends E. Loss of the 501c3 I started F. Loss of friends. Without medical marijuana I would have NEVER recovered. Brain Injury: About 7 years ago I fell off of a front porch and cracked my head open. I am trying to get back to normal! Explanation of Mask: I like to work hard. I like to be active and very helpful. I am an early riser. I go to the theatre to help decorate. 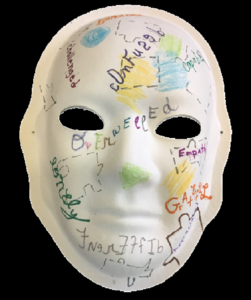 Explanation of Mask: From optimistic high functioning professional, wife and mother to dependent on help and low functioning. But I still look the same on the outside and people around me and myself expect more. PEOPLE DO NOT UNDERSTAND why you can function one day and not the next. It ruins relationships and careers. Brain Injury: Had a motorcycle wreck when drunk about 8 years ago. Was in a coma for 30 days. Explanation of Mask: I am a very happy and caring person – hoping that life will be better. Cross – my religion is an important part of my life. Family figure – my family is an important force and support. I am a good volunteer – working at Blessing Hospital. 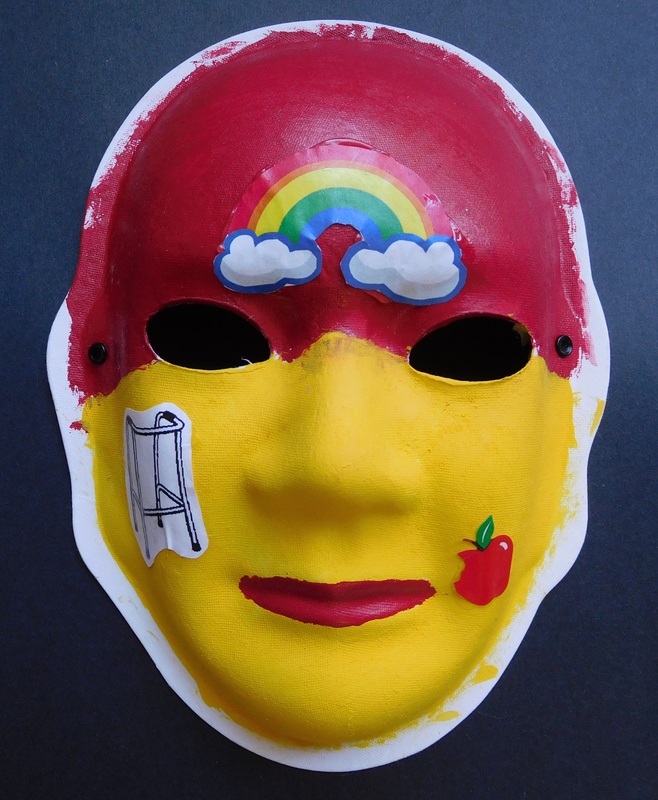 Explanation of Mask: The top mask shows how I am now, the happy-go-lucky man. 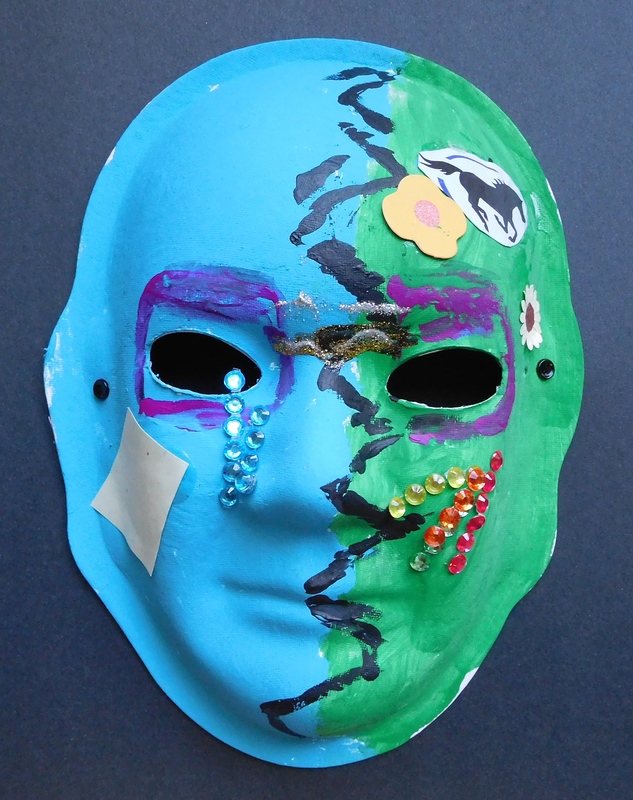 The top of the face is blue to represent a sky and the sun shining through the top of the side. The bottom half is green to represent grass. 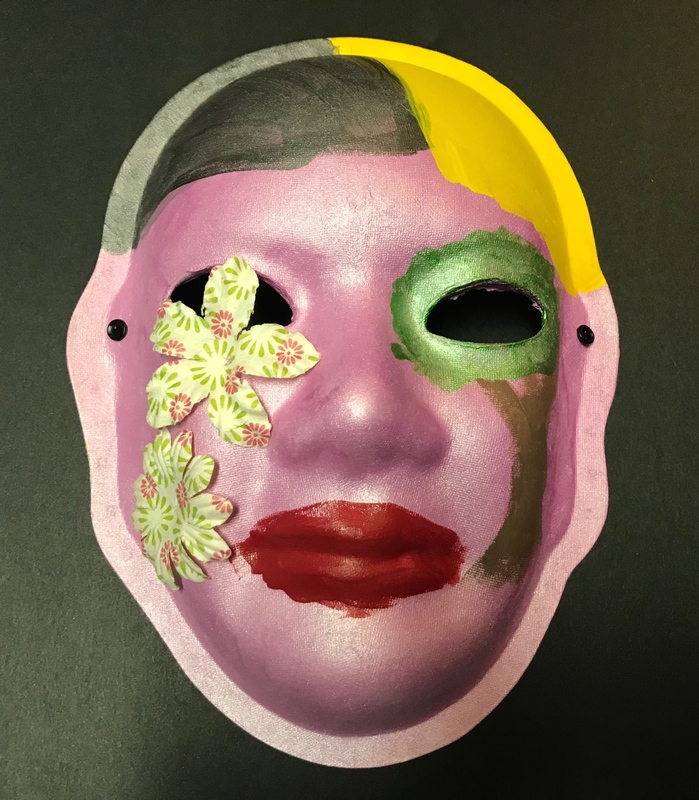 A flower grows up the side of my face. My eye is like the seed. It helped me grow and see a new beginning. Brain Injury: I had fallen off a moving horse. Dog came by and scared the horse and I got kicked in the head. Explanation of Mask: I don’t know what to say. Just that I’m very unhappy and hoping things get better. Brain Injury: April 7, 1988- had a severe motorcycle accident. Was in a coma and woke up with paralysis of the right side- my smile was lopsided. 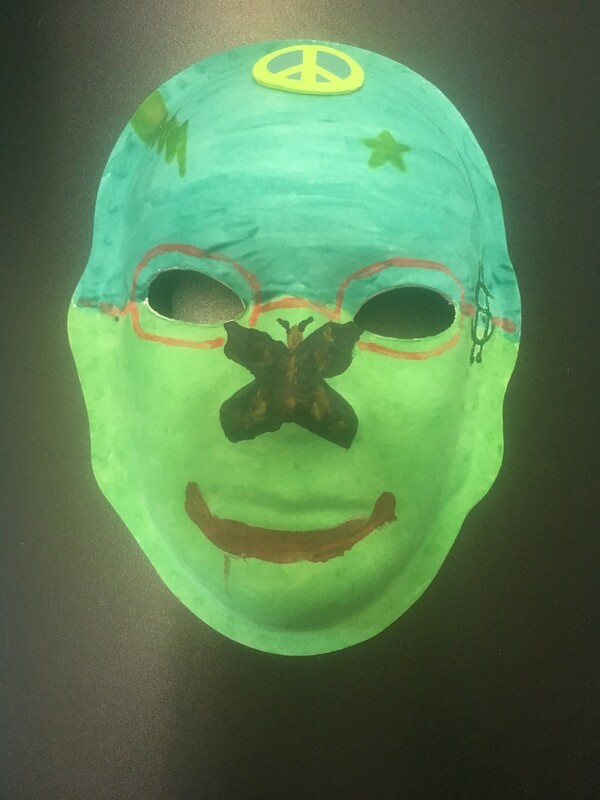 Explanation of Mask: My mask really shows my strengths. I am a miracle that I am alive. I am a happy and capable person. I like to volunteer with the Brain Trauma Awareness Organization. 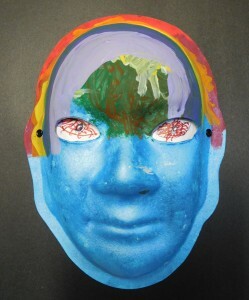 I really like to work with kids to prevent brain injury by wearing a helmet. The love of my life is my wife, Pam. She is #1 in my life. My family is important and supportive. I am from Oklahoma and like OU teams. “Partner” is my slogan. 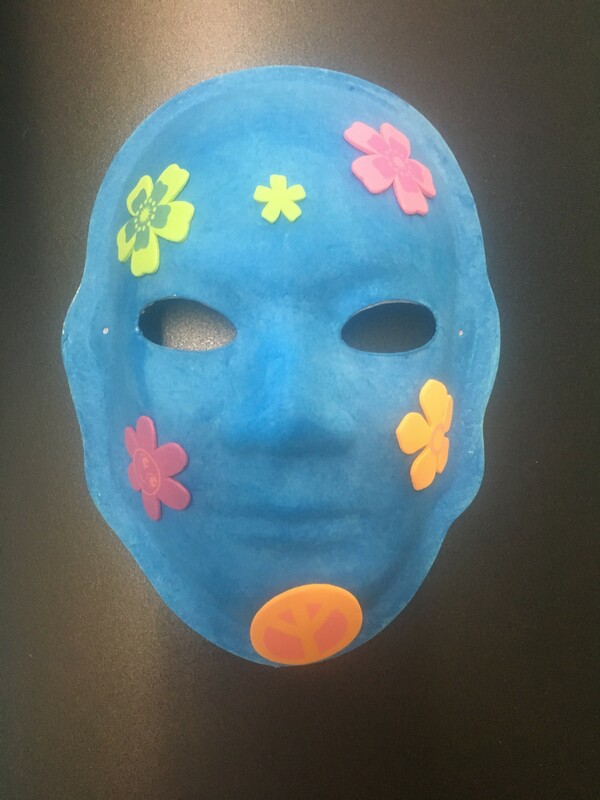 Explanation of Mask: I fell in December and received a concussion. Since then I have been anxious, forgetful, and angry about having the injury. I feel like I am foggy (in clouds), sad (teardrops), angry (lightning bolts), white face means scared and empty. Looking to the future since I am improving slowly (rainbow, sun). Brain Injury: Even though I may not have had a brain injury that caused me to go to the hospital. But I have been hit on my head plenty of times and I feel like it has caused me to be slower than other people. 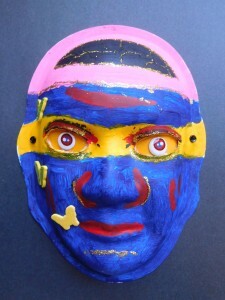 Explanation of Mask: My mask shows the half of me that is bright, loving and open. While the other half shows that I am scared, tired, worried and angry. I typically try to stay cheerful and happy so that people don’t have to worry about me. But then I am also scared and nervous to talk about how I feel because it makes me worried of how people will think of me. Also, even though my family has had their ups and downs, I still love them.